Facing persecution and violence for his anti-Nazi stance and as a Jew, Albert Einstein renounced his German citizenship. Upon Hitler’s appointment as German chancellor on January 30, 1933, Nazi persecution of Jews in Germany was swift and often violent. Prominent Jews were denounced by Nazi officials, attacked in the media, and subjected to violence and arrest by the Nazis and their collaborators. As a vocal opponent of Nazism and a staunch advocate of pacifism, Albert Einstein was a particularly attractive target. At the time, he was teaching at the California Institute of Technology in the United States. Nonetheless, the Nazis publicly agitated against Einstein as a symbol of “Jewish degeneracy” and accused him of spreading “atrocity propaganda.” In February and March 1933, the Gestapo repeatedly raided his family’s apartment in Berlin. Despite his own March 15, 1933, declaration of self-imposed exile from Nazi Germany, as well as warnings from friends that it was too dangerous to return, Einstein and his wife decided to travel back to Germany, intending to visit their summer cottage. While at sea, they learned that Nazis had ransacked the cottage in Caputh, at which point they decided that re-entering Germany was unwise. At this time, Einstein, a theoretical physicist, decided to pen a letter resigning his membership in the Prussian Academy of Science. 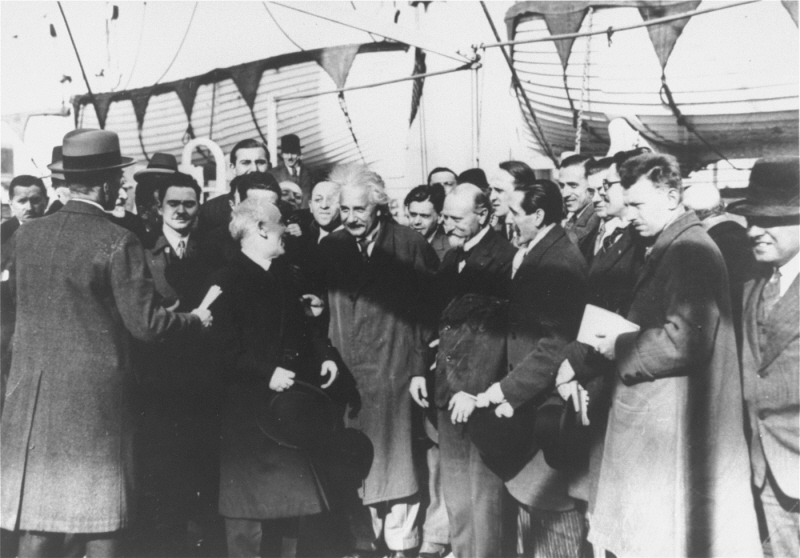 On March 28, 1933, their ship docked in Antwerp, Belgium, and Einstein immediately reported to the German Consulate in Brussels, where he turned in his German passport and renounced his citizenship. The German government promptly retaliated by confiscating all of Einstein's property and funds that remained in Germany. On April 7, 1933, the German government passed the Law for the Restoration of the Professional Civil Service, excluding Jews and political opponents of the Nazis from all civil service positions, including those in public universities. Among those forced to flee Germany were fourteen Nobel laureates and twenty-six of the sixty professors of theoretical physics in the country. March 16-23, 1933 News articles about Einstein's declaration of self-exile from Nazi Germany. March 29, 1933 - April 7, 1933 News articles about Einstein's renunciation of his German citizenship. April 1-30, 1933 News articles, editorials, opinion pieces, letters to the editor, and cartoons regarding Einstein's renunciation of his German citizenship and his acceptance of a teaching position in Spain. January-March 1933 News articles regarding Einstein's anti-Nazi and pacifist views. Friedländer, Saul. Nazi Germany and the Jews. New York: HarperCollins, 1997. Isaacson, Walter. Einstein: His Life and Universe. New York: Simon & Schuster, 2007.